Do you have motorhome insurance? Making sure your motorhome is adequately insured could be one of the most important things you do to prepare for your next vacation. Here’s why. 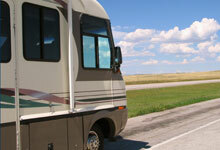 You need specialized Recreational Vehicle insurance (RV Insurance) coverage. You need insurance coverage that is not found in your typical auto or homeowner’s insurance policy. Unless you have the right protection package, you could be in for an unpleasant ordeal should you experience a loss with your RV. That’s because your auto and homeowners policies may not cover such items as stereos, CDs, TVs and other personal property as well as addressing the special circumstances that come along with over the road traveling. Guaranteed Total Loss – Coverage that ensures you get a brand new RV – even if it costs more than you paid for the original. Emergency Expenses – Covers lodging, rental car and/or travel home if your RV isn’t in condition to utilize it. 24-Hour Roadside Assistance – Coverage that will enable you to get your RV to the nearest qualified facility. Theft of Personal Property – Covers personal items such as clothing, cameras and tools inside or outside your rig. Disappearing Deductible – Reduces your Comp & Collision deductible by 25% for each claim free renewal period. Fire Department Coverage – When you have a fire incident that requires a fire department to provide services to your RV site.